If you like pad thai noodles or if you're looking for a low-carb noodle dish, try this delicious Pad Thai Noodle Salad! Based on world-famous Pad Thai noodles, this salad features bold Thai flavors and an abundance of textures. It's also light in calories and fat, plus naturally gluten-free and - surprise! - low in carbs (due to the use of rice noodles instead of wheat). Serve it up as a main course or side dish - also makes a beautiful salad to take to a summer potluck, picnic, or cookout. Lightly boil the rice noodles until cooked to al dente. Drain and rinse thoroughly with cold water. Set aside to drain while you prepare other ingredients. To make the dressing, pour 1/2 cup boiling water into a cup. Add tamarind paste, stirring until dissolved. Add the sugar, fish sauce and chili sauce, stirring well to dissolve the sugar. Taste-test this concoction - it should taste first sweet, then sour, spicy and salty, more or less in that order. Pour 1/4 of this dressing over prepared shrimp (make sure shrimp are well drained beforehand). Stir and set aside to briefly marinate. Place the red pepper, celery, spring onion, bean sprouts, coriander and basil together in a large salad bowl (hold back a little of the coriander and basil for garnishing later). Place a wok or frying pan over medium-high heat. Drizzle in 2 tablespoons of oil, then add the garlic and ginger. Stir-fry to release the fragrance (1-2 minutes), then add the shrimp together with the marinade. Stir-fry 3 minutes, or until shrimp have turned pink and plump. 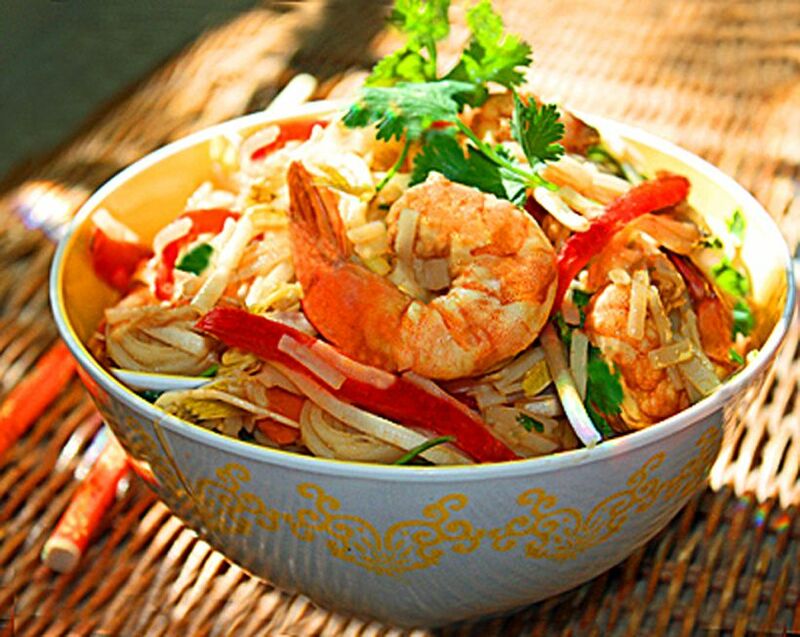 Remove from heat and "pour" these delicious stir-fried shrimp into the salad bowl. Do a final taste-test, adding a little more fish sauce if more flavor is desired, or more chili sauce if it isn't spicy enough. Portion out into bowls or plates, adding a final topping of coriander and basil, plus the chopped peanuts. More chili sauce can also be served on the side. *Tamarind paste is sometimes difficult to find. Look for it at your local Asian grocery store OR East Indian food store, or order it online. If you can't find it, white vinegar can be used as a substitute. Another substitution is lime juice. In this case, use the juice of 2 limes and reduce hot water by half.